Minibar Artist Space is a non-profit project based exhibition space for contemporary art located in Vasastan, Stockholm, Sweden. It is run and curated by artists Malin Henningsson, Sofia M. Westin and Anna Sagström. Minibar is created as a platform for presenting short-time exhibitions, collaborations and other art-related projects of all media. The short exhibition periods are used as a tool to re-strategise the principle elements of the exhibition format. It opens up to a fluctuation and tempo and enables a sense of spontaneity, complexity and optimism that is at the core of the Minibar philosophy. Regardless of medium, Minibar wishes to occupy the interstices of contemporary art practices with this attitude. The limited size of Minibar allows innovative site-specific solutions that re-examines the use of the gallery room. The space becomes an active parameter for the artists to take in to account when working in the room; the limited space can either be used as a catalyst or counteraction. By the use of set themes each season Minibar aims to connect the practice of individual presentations to an overall connecting idea, enabling discussions to be held on an overriding transformative and ephemeral level as well as manifested through specific concretizations. Minibar wishes to promote artwork and practices from local cultural producers as well as artists from outside of the Stockholm region, featuring both established and emerging artists. Whether through solo-exhibitions or interdisciplinary collaborations, Minibar aims to produce projects and initiatives that reflect upon the role of the artist and the art-exhibition at large. 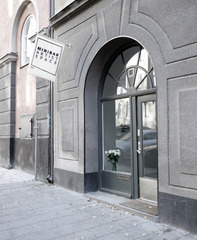 The gallery space, which is located in close proximity to some of Stockholm’s foremost commercial galleries, wishes to use this location as an opportunity to exist parallel, and sometimes in opposition, to the established art market as a non-profit artist space. Minibar is a non-commercial initiative.